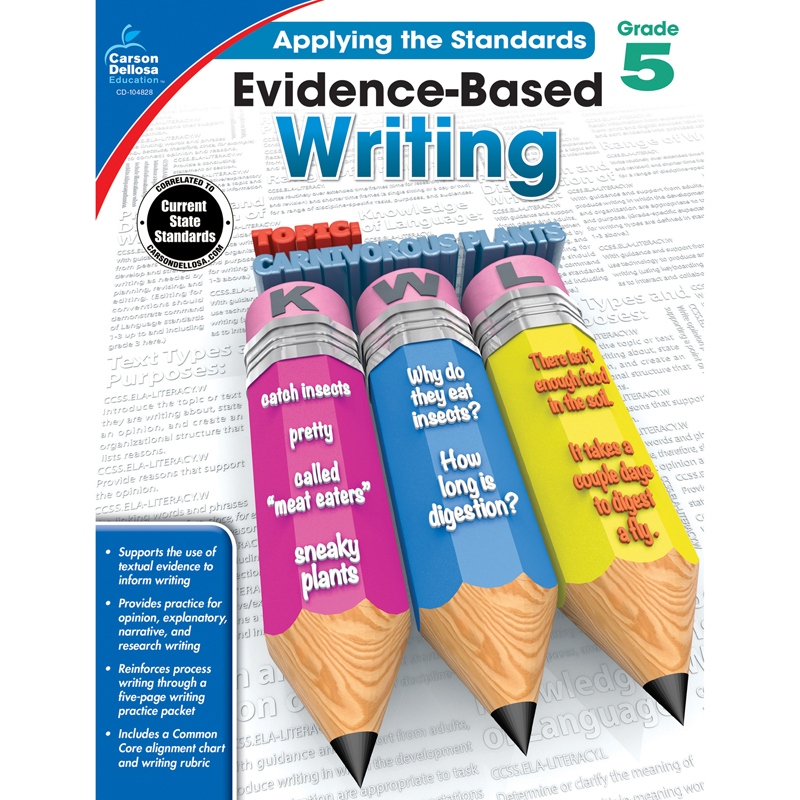 Evidence-Based Writing for grade 5 offers 64 pages of writing practice and prompts. It is aligned with current state standards and includes a writing rubric, a student writing checklist, a five-page writing process practice packet, and pages of writing prompts to encourage higher-level thinking and thoughtful writing. Each writing prompt is paired with a graphic organizer to help students plan, research, and prewrite. Specific writing types taught are opinion/argumentative, informative/explanatory, narrative, and research writing. Grade 5 writing prompts include world leaders, good health choices, voting, sports programs, national parks, and insects. The Applying the Standards: Evidence-Based Writing series for students in kindergarten to grade 5 emphasizes the reading—writing connection by requiring students to read and use facts from literary and informational texts. Various writing skills are taught in correlated activities such as prewriting, drafting, revising, editing, and publishing writing. Of particular emphasis throughout the series are current state standards and the teaching of evidence-based writing.